Time required: Minimum 1 hours required. Additional hours can be purchased upon check-out. Our two premium Mercedes Sprinter options are a step ahead of the competition. 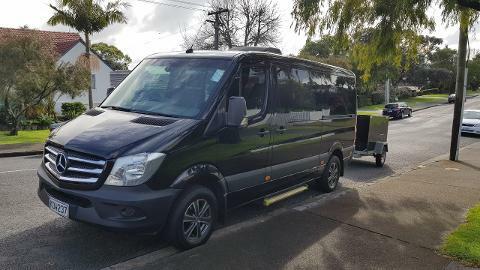 Offering a corporate level chauffeur service this is ideal for both small flexible business trips around Auckland or long haul travel where the ultimate in privacy and comfort is demanded. We will assist you with itinerary planning & provide an on-call 24 hour concierge service. Based in Auckland we cover all of New Zealand. For very detailed itineraries where efficiency is key our drivers carry out pre-runs of your itinerary to ensure no delays or issues arise on the day.